woke up to wet garage floor on holiday weekend Saturday. David L fm Pink Plumber showed up timely and performed excellent clean repair. Very happy and leak in wall was fixed. Everything was good except the pricing. I had this problem before and it only cost a fraction (1/3) of the price. Plus it's a holiday weekend so I didn't have time to shop around. Pink Plumber you're not the company for me. You wanted the job for $750 and another company wanted $250. That's a biggggg difference. PB is way overpriced ..... Don't use! The technician was very nice, knowledgeable, and pleasant. He was able to solve our problem for a fraction of what we initially thought it would be. I would definitely recommend them. Great job . As professional as they come. Dave L. Was the best . Easy to talk to about what he was going to do . He explained everything in detail to me. Overall awesome experience. The Pink Plumber in Tampa is the only plumber I will use from now on. Upfront pricing, showed up on time and fixed the issue on the first try. Dave L. was knowledgeable and professional throughout the process. I feel that I am a victim of being gouged. The bill was more than an Attorney would earn. 630.00 for a 45 min service call is unacceptable however at 8:00 PM with no running water with a child in the house I was hopeless. Same job without an emergency would have need half the price. Very nice and very friendly, quick and clean. Would highly recommend. Pink plumber was great. I called and had someone at my house two hours later. I know that can't always be the case but they were very accommodating to my time frame. The plumber they sent (Dave) was professional and knowledgeable. I'd use them again for sure. Was told by cabinet installers in the late afternoon that I needed to have a gas line relocated and some water lines capped. I tried calling several plumbing companies to try to get a repairman do the repairs and none had any available that evening. When I called Pink Plumber their repairman arrived in less than two hours. He was very professional and completed the work to my satisfaction. Its terrible when a company has to rip people off. I understand this is a job but to charge someone $500+ for a $20 job is crazy. That God for friends. What this is a straight up scam. Now im no plumber and i would have gladly paid $100 for my pipe to be fixed even though i know it was a $20-30 job. This is sad the companies due this to people i could only imagine all the helpless people that are taking advantage of on a daily basis. The Pink Plumber is scamming people and the crazy thing is when you call out your plumbers they can't even deny it. I know this review will get deleted but I wish the person who reads this could be the one to start a change within your organization. But I will definitely be an advocate against your company. David was very professional and covered any questions we had. If he didn't have the answer David made the effort to find out and his plumbing work is fantastic. Water main into home broken on Sunday. Googled plumbers and Pink Plumber arrived with in the hour. Although price was high for repair, job was done professionally and quickly. Water back on to the house in about one hour. Lucky Pink Plumber works 24/7 since it would have been tough to make it until Monday without running water. Thanks to Dave L who did a great job & provided good customer service. Recommend the Pink Plummer to anyone. Just remember pluming work is expensive, but you get quality work done with the Pink Plummer, plus its warrantied. When I called on a Sunday Pink Plumber was able to come out that day!! Dave came out on a late Sunday. Called when he was on the way. (They kept in constant contact). When he got here he listened to our problem gave us the plan then worked the price to get the best one. He was professional and courteous. If i ever need one again I will be sure to ask for Dave!! Thanks Pink Plumber and Dave@!! David was very cheery even at midnight and he was extremely helpful. David is fantastic. He came to followup on a previous call and installed a new master bath shower drain. He was neat, courteous and professional. He finished the work quickly and cleaned up after himself. I highly recommend David L. and the Pink Plumber for all your plumbing repair needs! He was very professional. He stayed until he found out the problem and cleaned up after the job was done. I highly recommend him. Our technician David L. Was very professional. Our emergency happened on Late Saturday night and he showed up promptly the next morning as promised. He was courteous and quickly identified the problem and affected the required repairs at a fair and reasonable price. 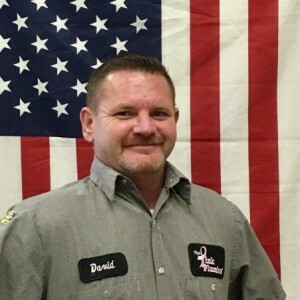 I highly recommend David and the Pink Plumber to everyone needing plumbing repair!